The brilliance of a precious stone is paralleled, perhaps, only by the beauty of the person who wears it. How can something so small and belonging to the dirt and coal, cast such a spell? I believe it has much to do with the rarity of the stone, than its existence. The same is to be said about grace and beauty. There are many beautiful people who capture our attention, but those with grace are the ones that capture our hearts. Introducing "Crimson Jewel , LXV's graceful second release inspired by the 39th KamaSutra art of "Maniragakarajnana", the Art of Precious Stones. To work with a brilliant winemaker, right from the get go, has been an honor for LXV. To create Crimson Jewel, winemaker Amy Butler created a brilliant Sangiovese, and cast it in a rare setting of Petite Sirah. A unique blend of 75% Sangiovese and 25% Petite Sirah, the Crimson Jewel offers up a generous, fruit-driven nose and lively yet full-bodied palate. Sangiovese's rustic tendencies are polished by the unabashed lushness of the Petite Sirah to create a multi-faceted wine that shines first in the glass, then in the complex clarity of the nose, and finally shows depth and elegance on the palate. The label features the portrait of Berkeley jewelry designer, Rhiannon Griego, wearing her own creation of chains that adorn the sensuous décolletage, with a brilliant blue stone that pays homage to what matters most, the heart. This is what she says on the back label : "I drift through visions of times when desert dwellers craft talisman's and artisan's carve cameo's on the shores of ancient cities. The beauty of ritual adornment inspires and moves through me as I translate the language of jewels." Adorned with a Silver Medal from the San Francisco Chronicle, Crimson Jewel is a wine made for lovers and their fantasies. 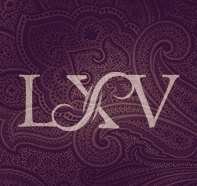 About LXV : LXV is a premium California Wine, inspired by the 64 arts of KamaSutra. Every release of LXV presents a unique blend, showcased by an art of KamaSutra. The anchor of each label is the portrait of an artist and their philosophy on art and sensuality.